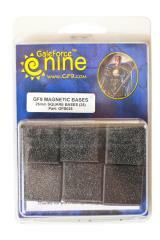 Gale Force Nine’s Magnetic Basing System is the ultimate solution for your model basing needs. Each pack of bases contains ready to use magnetic bases. Your forces will always be battle-ready, be it in their movement trays, display boards or army transport case. Every pre-sized base is a powerful magnet, topped with molded plastic. Simply mount your miniature as you would on any standard plastic base, paint and flock the base and your model is ready to take to the battlefield. The magnetic base will adhere to any ferrous surface and is strong enough to hold even metal models in place. The bases work great with a sheet of GF9 rubber steel (sold separately); a flexible ferrous surface with a self-adhesive coating on the back. GF9’s rubber steel may easily be cut to any shape or size to fit into a movement tray or on a display board. A handy instruction sheet in each pack lists tips on how to best mount your models and basing materials on these fantastic bases. Gale Force Nine's Magnetic Basing System guarantees that your models will be more attractive than ever!